The MCP1711 is a very accurate CMOS low dropout (LDO) voltage regulator that can deliver up to 150 mA of current while consuming only 0.6 μA of quiescent current (typical). The LDO output is stable without the need of capacitors due to excellent internal phase compensation. Eliminating capacitors can save space overall solution cost. However, for better transient responses, the output capacitor should be added for enhanced performance. The MCP1711 has a true current foldback feature for added protection when the load decreases beyond the MCP1711’s load rating. The package options for the MCP1711 are the 4-Lead 1x1 mm UQFN and the 5-Lead SOT-23 which makes an ideal choice for small and compact applications. 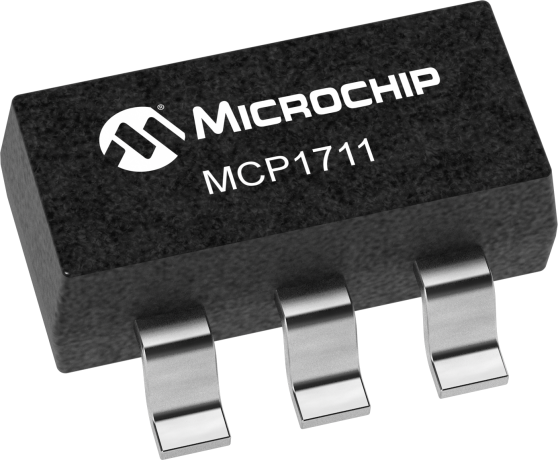 The MCP1711 Demonstration Board is used to evaluate and demonstrate Microchip Technology’s MCP1711 Ultra-Low Quiscent Current, Capless LDO over a wide input voltage and load range.